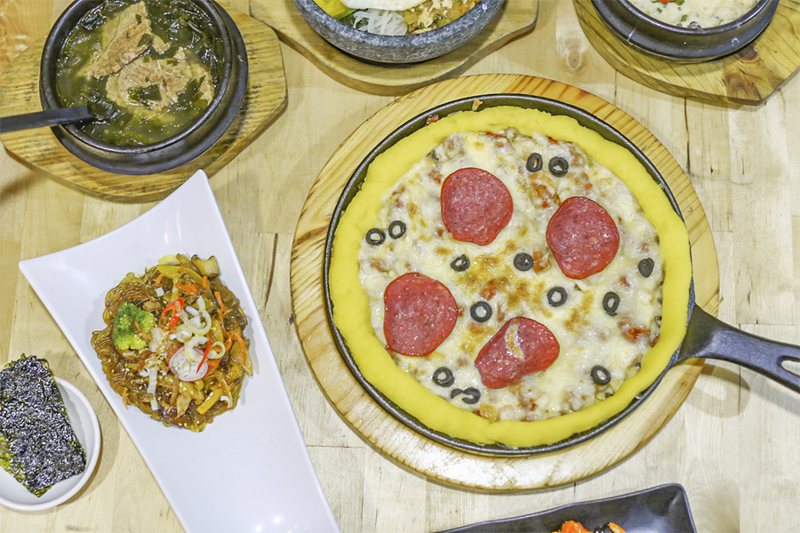 Korean Pepperoni Kurobuta Pizza, Snow Honey Butter Chicken Bumbuk, Cheese Rice Cake Stew… Kimchi Korean Restaurant has gotten more adventurous with their new revamped menu. 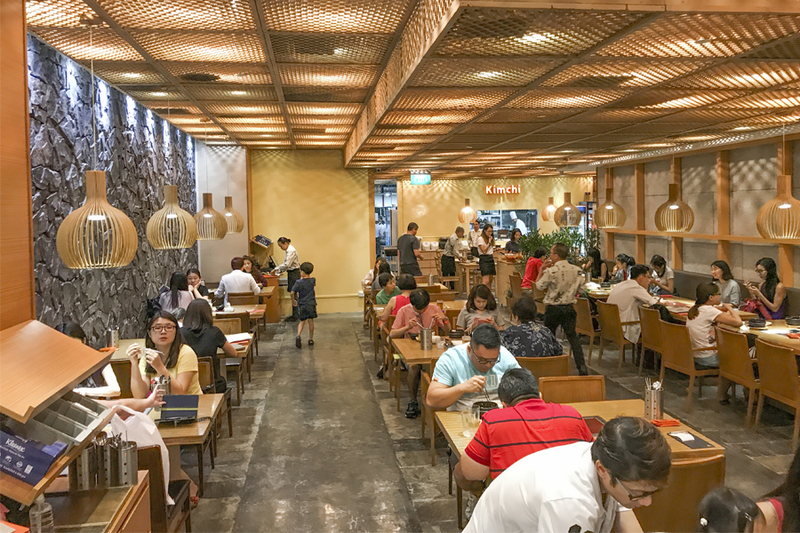 Located at the Suntec City Convention Mall side (above H&M and Uniqlo), this home-grown brand has been popular and fairly successful, having gone on to open Guksu next door, Hansul at Tanjong Pagar, and Hanguk Kitchen – which supplies cooked and dry food to other restaurants, cafes and hotels. 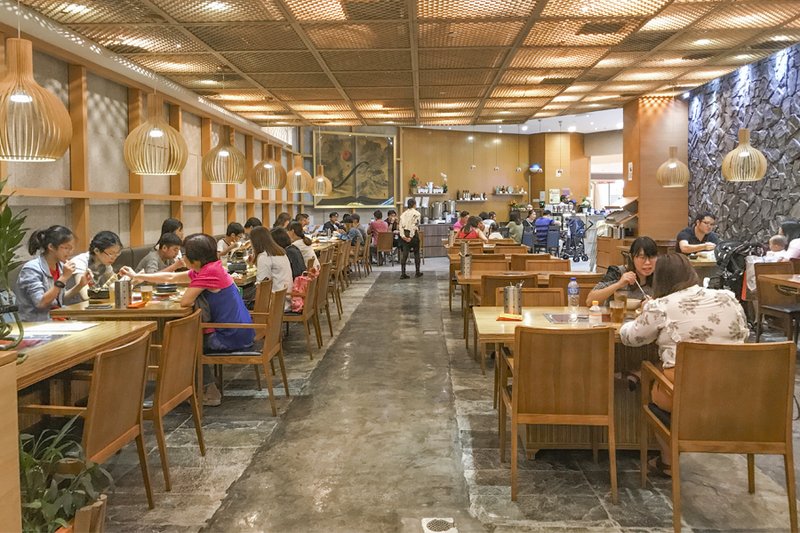 Executive Chef Choi Ming Chul has an impressive resume from Ritz Carlton (South Korea, Naples USA) and Marina Bay Sands (Singapore), supported by a kitchen team comprising of mainly Korean cooks and chefs from the university of F&B and hospitality in Korea. 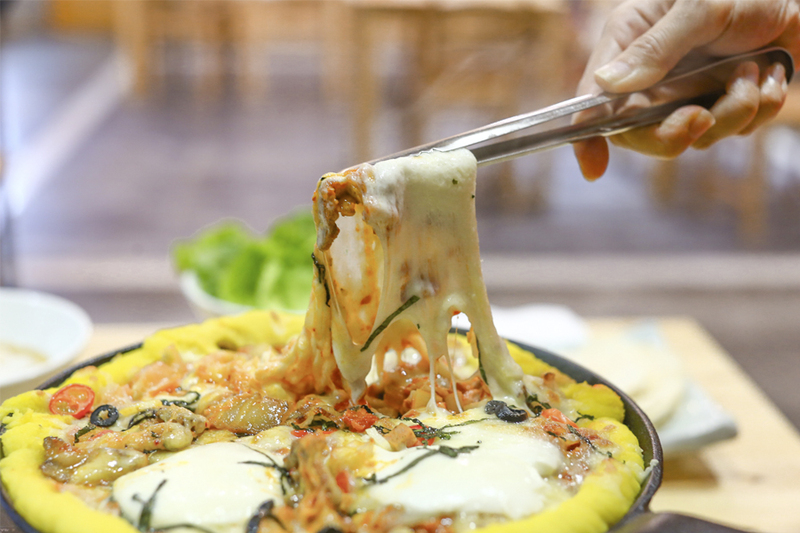 There are a few other reasons *cough cough* why I happen to visit Kimchi Korean Restaurant quite regularly. My female friends would sometimes wonder if “handsome boss” (Haden Hee, who is also a part-time actor/model) is around. 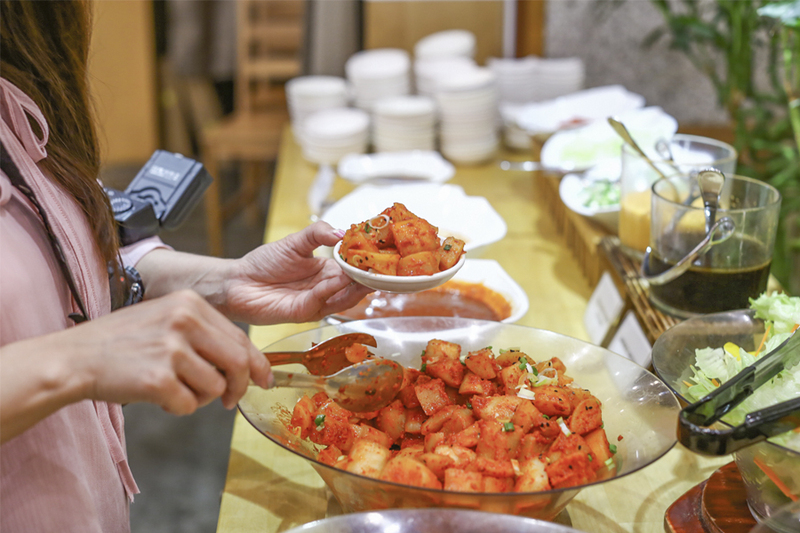 To have him serving kimchi, makes the meal all the more tastier. 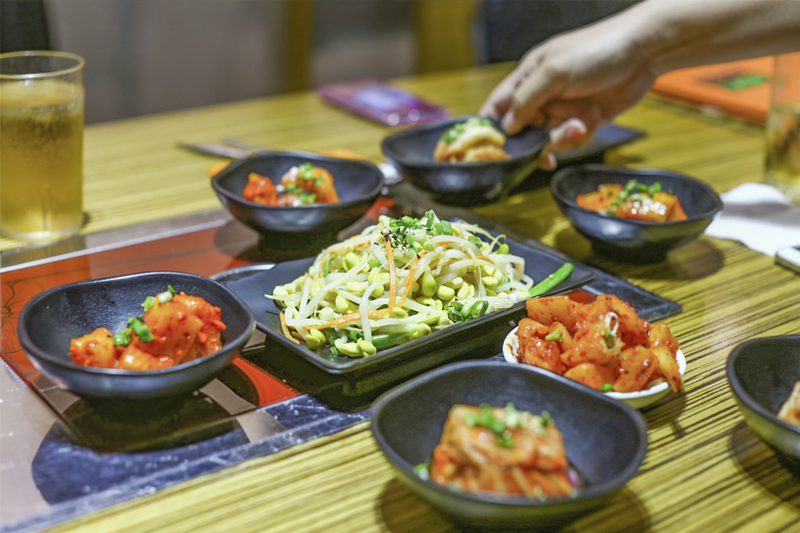 Anyway, talking about kimchi, other most other Korean restaurants where small dishes of banchan are served before the meal. 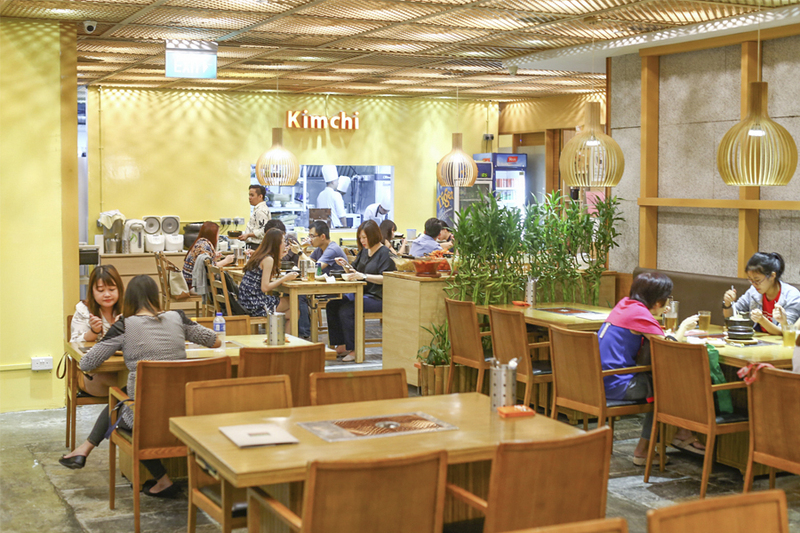 Over here, kimchi, pickled vegetables and sides are available FREE FLOW at the counter. 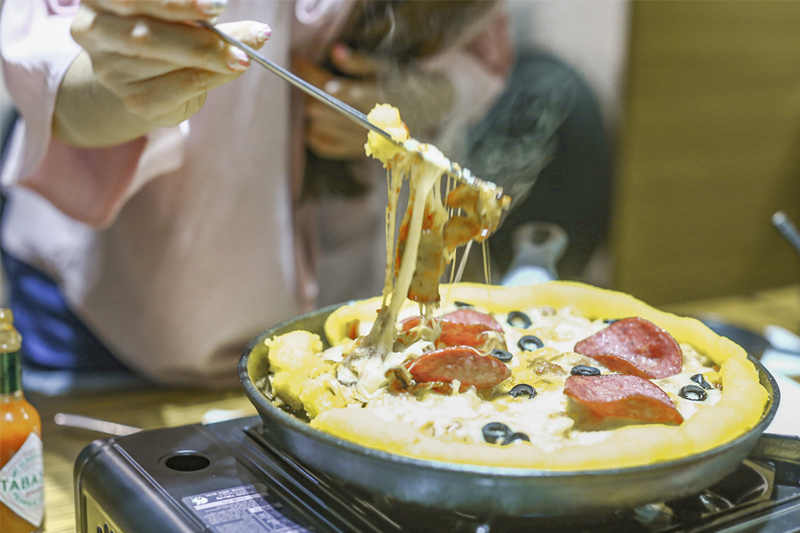 A good portion of the ala carte menu is also below $15, making it an affordable place for a Korean cuisine get-together. 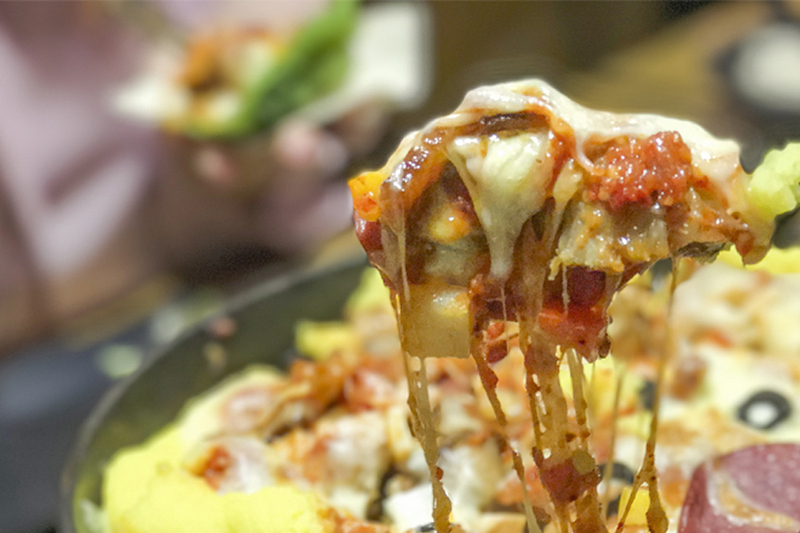 You may have eaten lots of pizza in your life, but this Korean ‘pizza’ promises to be different from all others. When the huge dish arrived with a portable gas stove, we wondered where the base was. Technically, there was none, but a layer of soft mashed sweet potato lying around the circumference. That was where the fun began. The base was in the form of separate tortilla skin or lettuce (for lower carb version), then you pull up your favourite ingredients of Kurobuta pork belly, chorizo sausage, mushroom and onions, all complete with stretchy mozzarella cheese, and stuff them in the wrap. 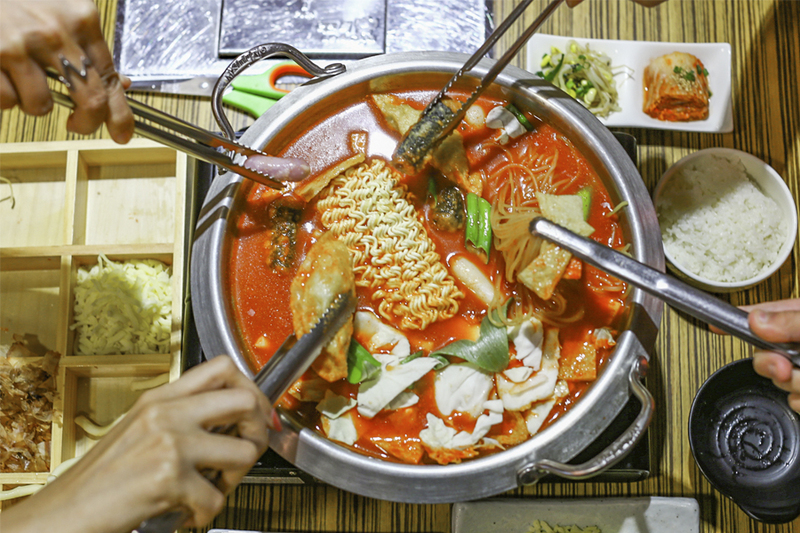 Add some of the accompanying ssamjang sauce (spicy paste) or tabasco for that extra kick. This is a similar version. Cheese lovers should prefer the previous buffalo mozzarella, while I enjoyed these pepperoni toppings more. The entire process of wrapping meat around the lettuce, was akin to have Korean barbecue, with less of a waiting time and mess. I liked that refreshing crunch, and it didn’t feel as heavy. 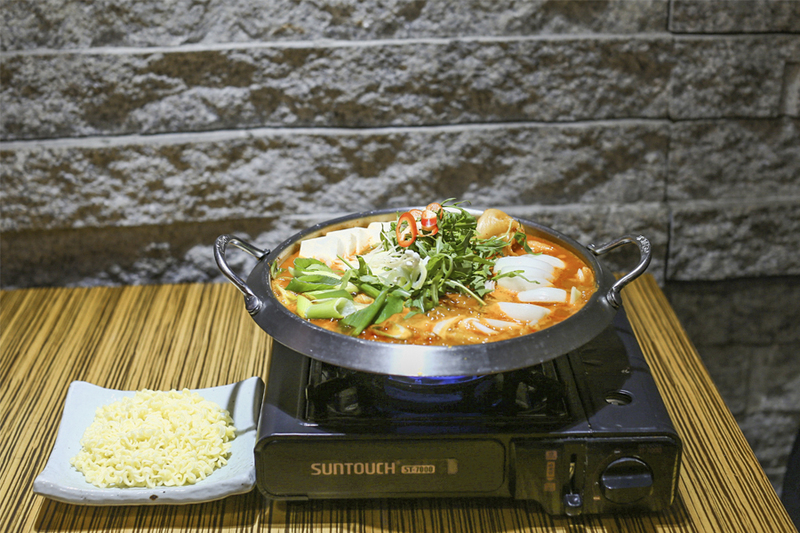 Fun, great for sharing, and the higher quality kurobuta pork made it all more addictive. Though meant for 4, our table of 3 almost finished EVERYTHING. 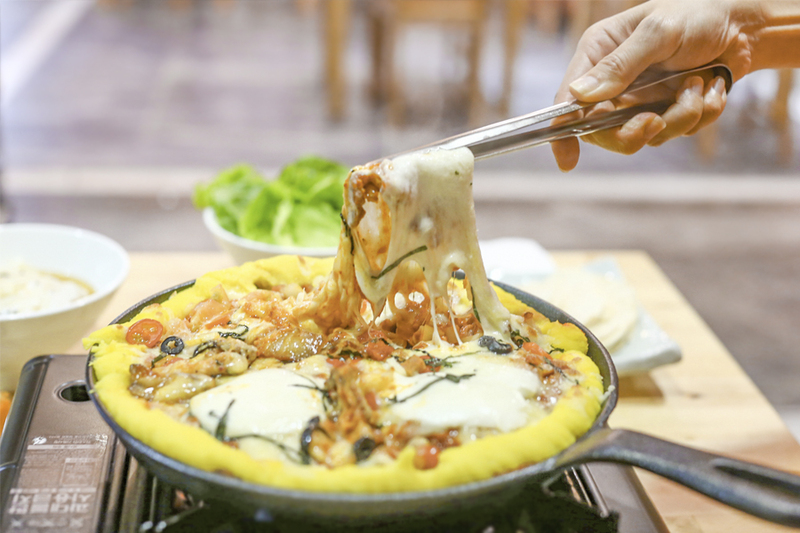 I am a huge fan of Korean army stews, but I never had rice cake stew served this way before. It was like a cross between army stew, hotpot and oden. There was a pot of spicy bean paste stew, where a box of ingredients came separate with compartments (now you know why I say oden). 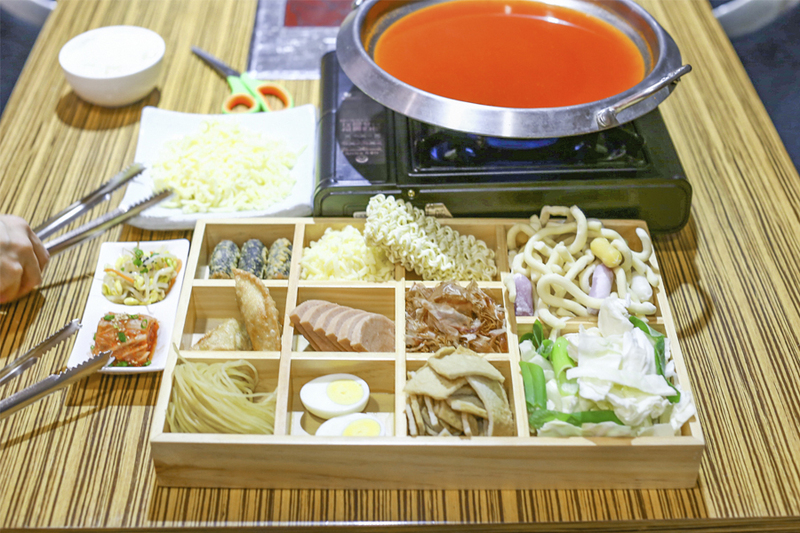 Like having hotpot, you add ingredients that you like – from rice cake, prawns, mussels, oysters, crab, fish cake, luncheon ham, kim mari (Korean deep fried seaweed roll), cabbage, onion, jjol meon (chewy wheat Korean noodles), instant noodles and boiled egg. All at your own pace. I would suggest having the stew on its own first, before adding the mozzarella cheese half-way through which would turn the base thicker and slightly saltier. If you prefer your stew with a tangy kimchi slant, this would whet your appetite. Filled with tender pork belly (check out how massive a piece it was), enoki mushroom, wild rocket, leek, onions, beancurd, and instant noodles, the Kimchi Dae-Ji Samgeoup Sal Jjim was a great sharing dish. Just stew and rice worked wonders. 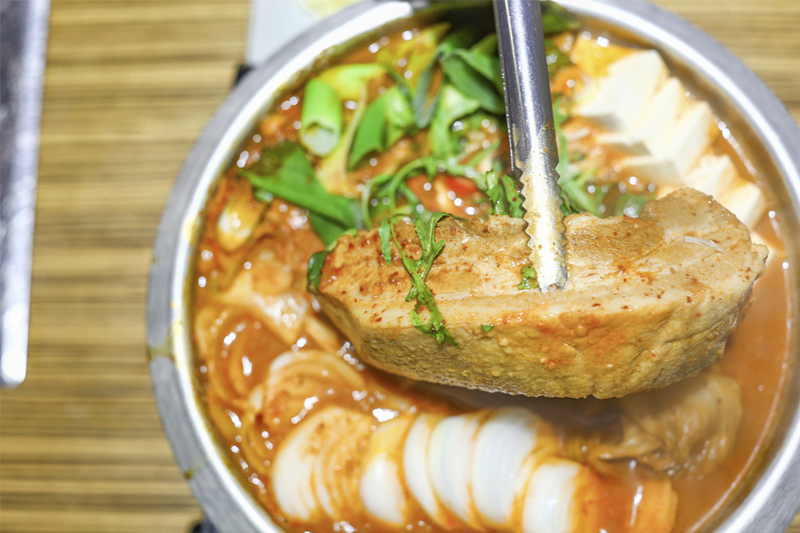 Warm, hearty, spicy, ultra-comforting, especially when the fatty pork ‘melted’ into the stew. 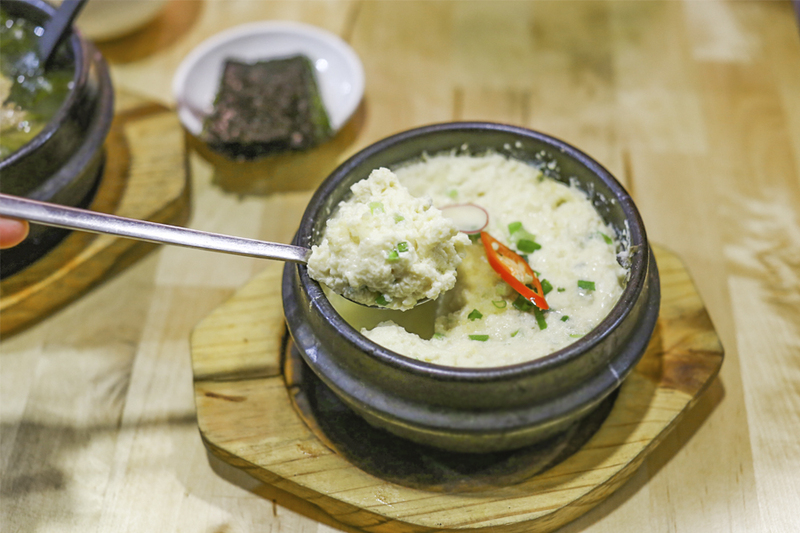 ‘Sundubu’ is freshly curdled soft tofu stew. 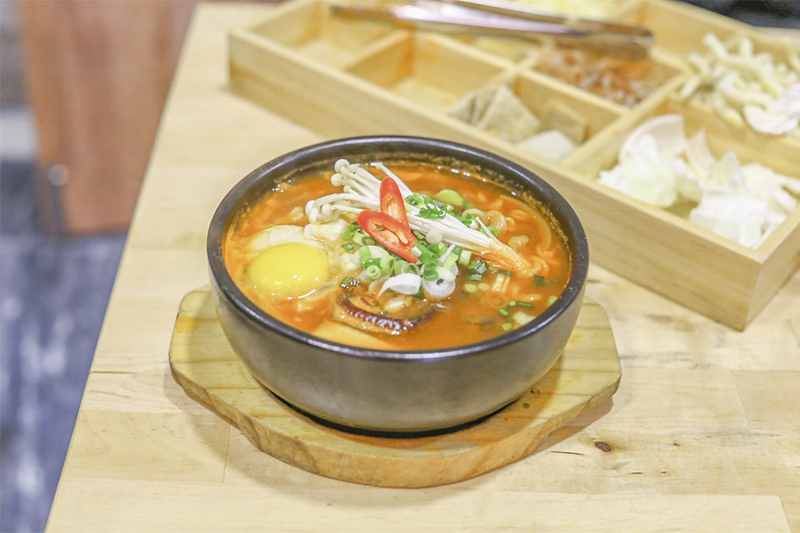 Kimchi’s version comes with seafood-based broth, soft tofu, pork collar, vegetables and egg, served with rice. I ordered the pork version, though are other choices of chicken, clam, tuna and seafood. Between all the stews, I actually liked this best. Perhaps because the taste was cleaner, with not that much going on. 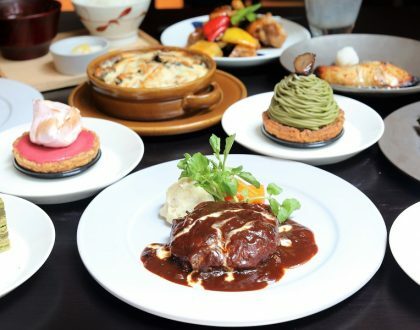 The portion’s good for individual, suitable for ordering if you are dining alone or in a small group. My female friends like this better than I do. Is it psychological or what? 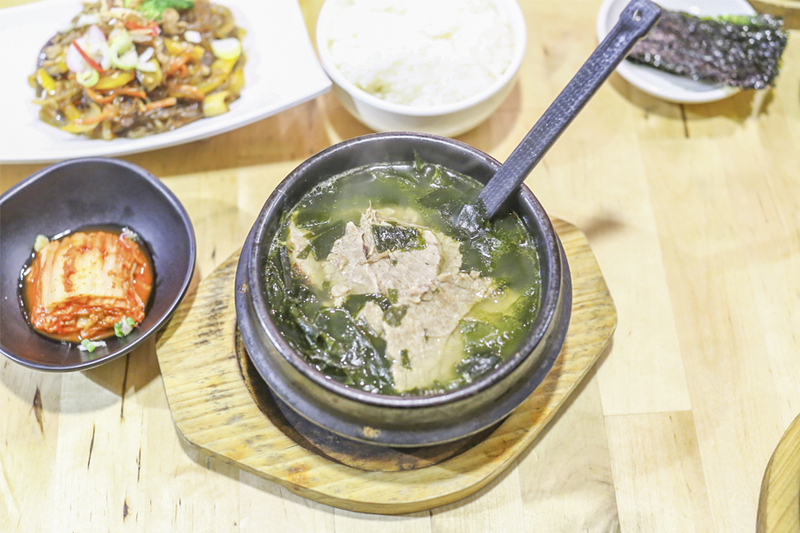 The Miyeok-guk, or Korean seaweed soup, is traditionally consumed since the Goryeo Dynasty by Korean women after giving birth. 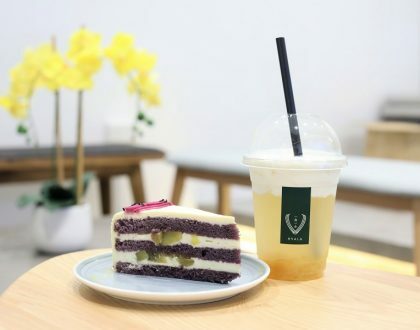 That is because Miyeok (edible seaweed) is rich in calcium and iodine, with nutrients that in the Koreans believe to be important for pregnant and nursing mothers. Friends who loved it, said the soup was flavourful with delicate briny flavour of the seaweed. Interestingly, the ramen at Kimchi uses a beef broth base. 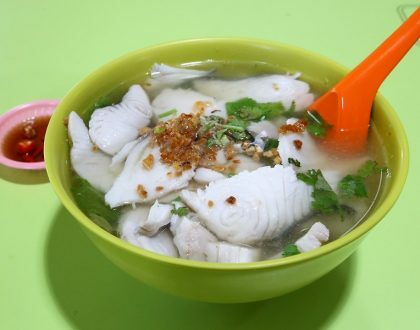 Added with seafood such as octopus and clams, you can imagine that it would be quite rich and nourishing. Slurp-worthy. Also, I noted that the Korean noodles used were different from the instant noodles used in the stew. This was frozen Korean noodle, with a springier, chewier bite. 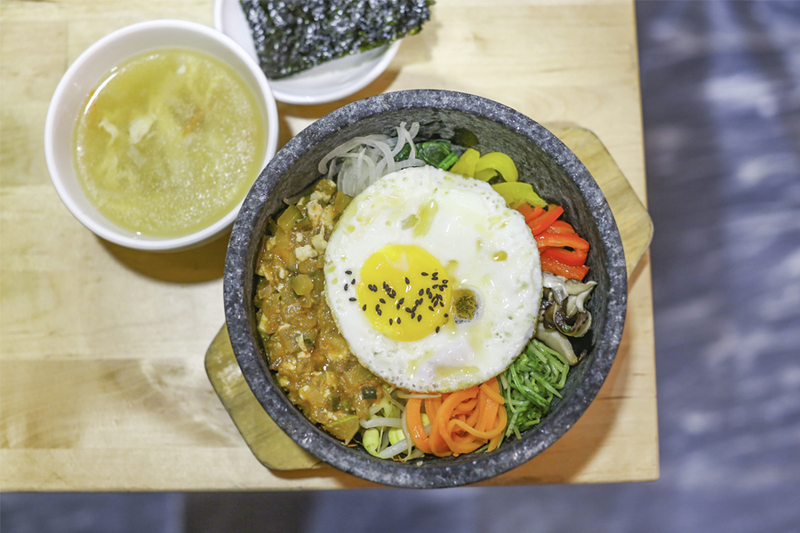 Korean Bibim Bap served in a sizzling hot stone which gave the bottom a thin layer of crunchy crust. Adding the savoury fermented bean paste added a salty-rich flavour. “I want my steamed egg.” This would actually be first-to-order on my next visit. Cooked with vegetable stock and added with flying fish roe, shrimp, squid, and leek. Soft and wobbly, simple and comfortable. 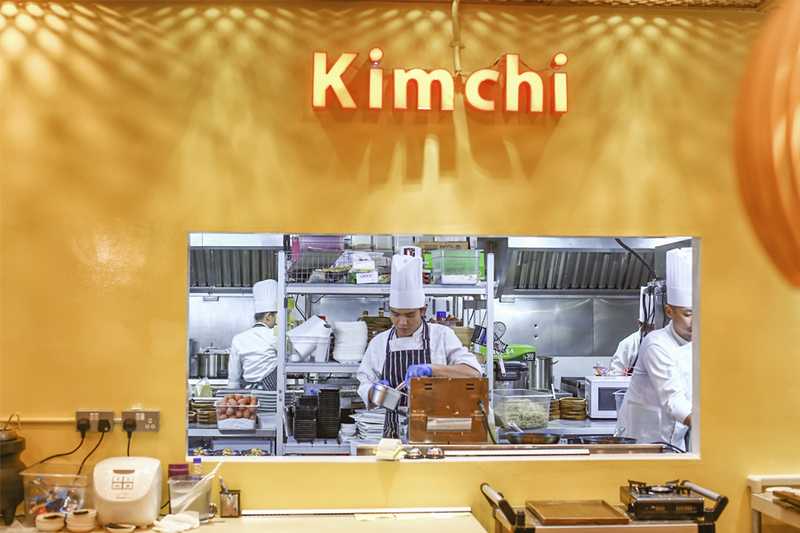 Good to know that over at Kimchi, there are also 3 exclusive VIP rooms you can reserve, if you need to have a small corporate lunch or birthday get-together. 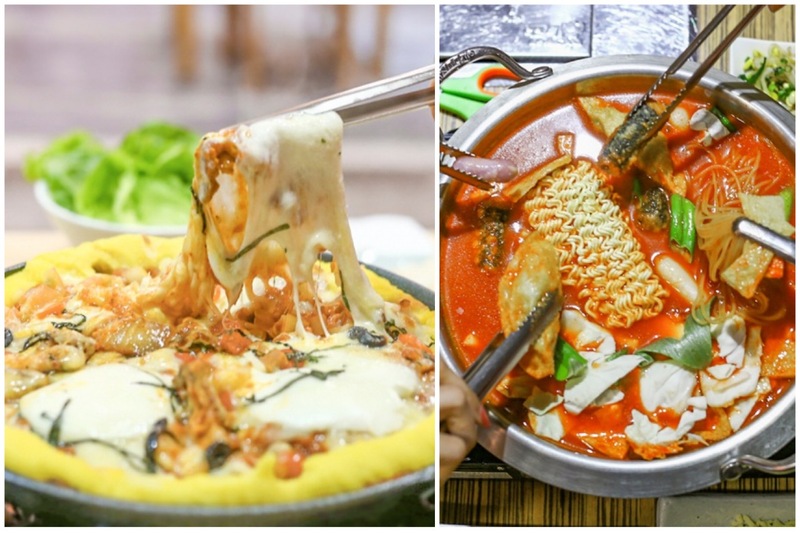 Beyond some ‘instagrammable’ cheesy food that would appeal to the younger diners, I was glad Kimchi retained its more traditional roots for us to serve more authentic Korean dishes all in one place. 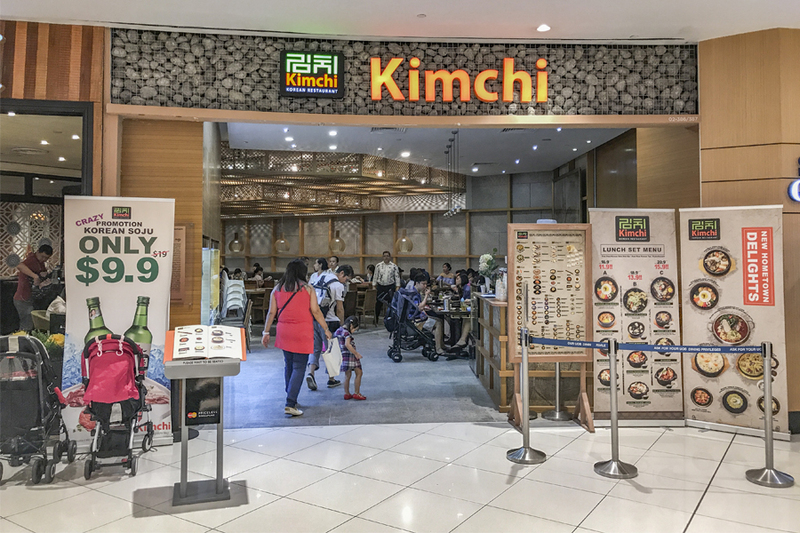 * This post is brought to you in partnership with Kimchi Korean Restaurant.